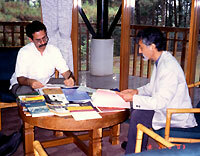 Negotiations with Bogor Agricultural University (IPB) on the Bogor Field Station (BFS) began in March 2003, an agreement was completed in February 2004, and the BFS was set up with an office room, meeting room and laboratory. 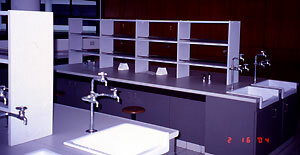 Office and laboratory equipment is still inadequate. In fiscal 2004 we will set up equipment that incorporates digital maps of the research areas in the computer; and we would like to broaden the use of the BFS as a place of research and information exchange, not only for students and faculty members of ASAFAS and CSEAS, but for students and teaching staff at other Japanese universities and for Indonesian researchers as well. 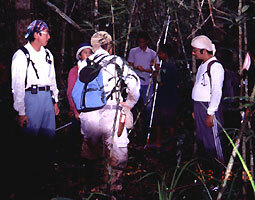 Four graduate students were sent for research in FY2003: SHIMAMURA Tetsuya (enrolled in FY1999) to study tropical peat swamp forest vegetation (May 7 to June 5); Wahyu Prasetyawan (enrolled in FY2001) to do a political-economic study of national and local elites (August 5 to September 24); MASAKI Keiko (transferred to the Scholl in FY2000) to study the relation between Balinese gamelan music and religion (June 7 to March 6); KOIZUMI Miyako (enrolled in FY2001) to study the ethnobotany of the Penan Benalui in Pujungan (Jan. 7 to March 30). 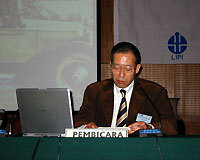 KOBAYASHI Shigeo (ASAFAS faculty member) carried out a study in Leuwiliang "Study on the landscape-level rehabilitation of a degraded tropical forest" as a project funded by the Ministry of Environment Global Environment Research Fund and has been carrying out joint research in Riau Province, "Study on soil resources management options and community empowerment for controlling global warming in swampy areas in Southeast Asia," with research institutes such as Forestry and Forest Products Research Institute, Ehime University, Tokyo University of Agriculture and Technology, and National Museum of Ethnology, as well as with Indonesian Institute of Sciences and Bogor Agricultural University. 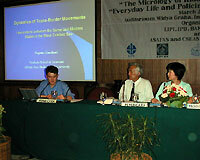 SUGISHIMA Takashi and NAGATSU Kazufumi (both ASAFAS faculty member) held a Field Station Joint International Workshop on March 23, 2004 at Indonesian Institute of Sciences in Jakarta. This workshop was a joint project of the Bogor FS and the Kuala Lumpur FS and was jointly sponsored by ASAFAS, CSEAS and the Indonesian Institute of Sciences, Bogor Agricultural University. and the National Coordinating Agency for Surveys and Mapping (BAKOSURTANAL). 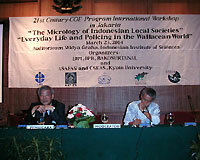 SUGISHIMA oversaw the morning session, "The Micrology of Indonesian Local Societies," and NAGATSU, the afternoon session, "Everyday Life and Policing in the Wallacean World." In the two sessions 17 people, including seven ASAFAS and CSEAS faculty members and one ASAFAS graduate student, presented on their research results. The workshop's prospectus and program can be found at the following websites. At the reception after the international workshop, we discussed the cooperation of the Bogor FS with Dr. Supiandi Sabiham, professor at Bogor Agricultural University, our Bogor FS counterpart. We confirmed that they would continue to provide facilities to ASAFAS graduate students carrying out on-site research based at the Bogor FS in terms of the use of laboratory equipment and storage of materials, and at the same time we asked their cooperation in the International Workshop of the 21st Century COE Program which is planned for 2005 at Bogor Agricultural University.